It's that time of year again. fast horses, beautiful hats, the singing of my old Kentucky home, and lots of celebrations. 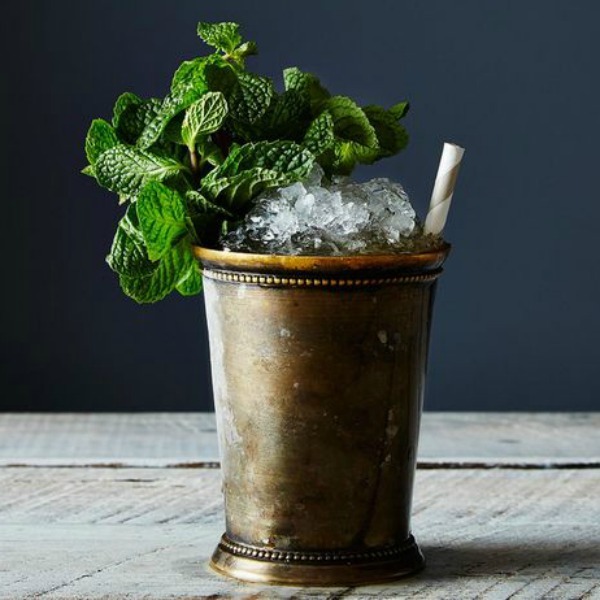 Yes, today is the run for the roses, also known as the Kentucky Derby and no derby party is complete without the official drink, the mint julep. Those of us who are native Kentuckians, were practically weaned on mint juleps, but for those of you who have never had the privilege, I am including a recipe. let me say, with all due respect, that if you have never had one of these jewels, I would recommend that you sip slowly on one for several hours. If you do not want the alcohol, I can recommend these delicious cupcakes. Don't worry. The alcohol will cook off. Preheat the oven to 350º F, and grease or line 30 cupcake cups. Combine salt, baking powder, and 1 3/4 cups of the flour. Beat butter, sugar, eggs, and extracts in a large mixing bowl until creamy. Gradually beat in the flour mixture. Add the milk and liquors to the batter, then the rest of the flour (1 cup). Mix as little as possible, just until the batter comes together. Divide the batter evenly among the cupcake cups. Bake for 25-30 minutes, or until a toothpick inserted in the center of a cupcake comes out clean. Let cool. Combine the powdered sugar, salt, extracts and melted butter and beat until creamy. Gradually add milk until the texture is right for piping. When the cupcakes are completely cool, pipe or spread the icing on top. Garnish with cake sparkles or sprinkles, a straw (trimmed to size), and mint leaves. I'm thinking this is not the low calorie version, but hey, after you run around the track a few times you're bound to burn them off. Well, i'm off to find my hat and read the racing form so you all have a nice day. I love a mint julep! Such a treat! Both look positively delish! Enjoy your Sunday, dear Laura.